by Daniel Keever on October 9, 2018 . So you want to start advertising online? Awesome! But where do you start? How do you know which platforms will give you the best results? What about strategies? Well, you came to the right place. Here is your all-in-one guide to getting started in the online advertising world. We will walk you through a simple but meaty approach to online advertising, showing you the best ways to use online advertising, the best platforms, and the best strategies to leverage what they have to offer. Before we jump right into the online advertising platforms themselves, you need to have a clear picture of where online advertising fits in your sales funnel. If you don’t understand this, your strategy has next to no chance of accomplishing your goals. Where do you think advertising fits into your company’s sales funnel? 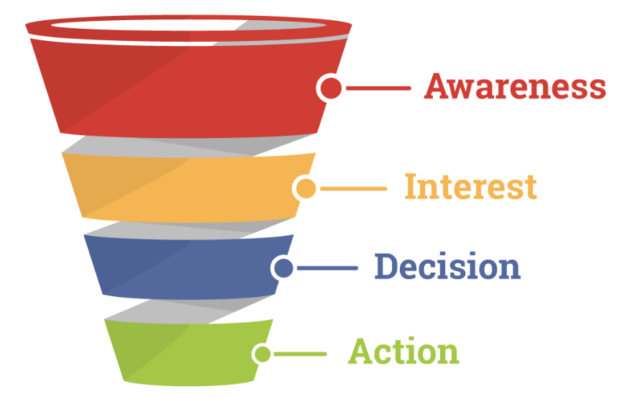 Most commonly, advertising sits towards the top of the sales funnel. This is because it’s a great tool for brand awareness due to its targeting options in every platform including search, display, and social. Here’s a few examples of how online advertising increases brand awareness. In many cases, online advertising is the most cost-effective way to capture customers who are just entering the market. In traditional marketing, you employ a sort of spray-and-pray tactic, hoping that your advertising is seen by some people who are interested in your product or service. With online advertising, you can filter your targeting by intent in ways traditional can’t. 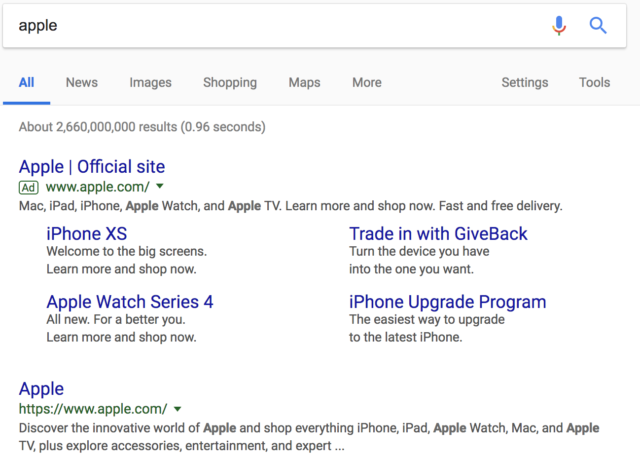 One way you can do this is with search ads. 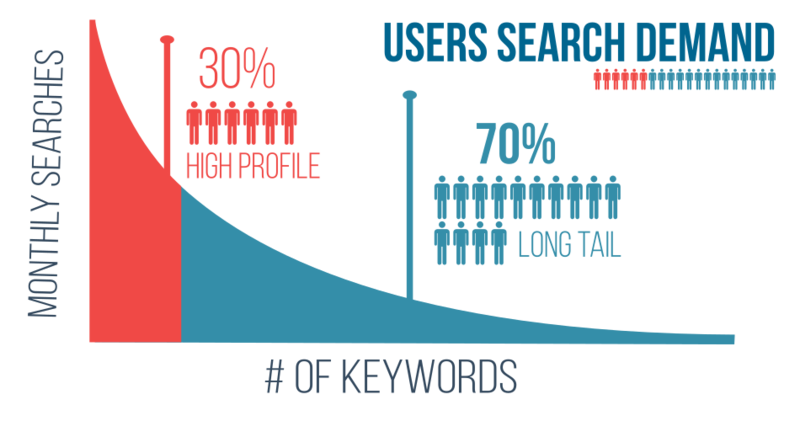 You can target keywords that demonstrate a customer without brand loyalty. For example, if you run a restaurant, what kind of keywords do you think people would search if they were looking for a new place to eat? They are likely to search terms like “restaurants near me” or “places to eat near me”. Getting in front of a potential customer at this point is exactly what you want because you don’t have to change their mind – they weren’t planning on going anywhere else! You found the best kind of prospect using search. Online advertising doesn’t just provide a way to get in front of new customers. It lets you stay top of mind too while they are going through their buying process. Once you’ve used online advertising to make your prospects aware of your brand, you can keep your offer in front of them while they think about their decision. This is called retargeting. Retargeting is one of the most effective advertising tools in terms of ROI because you can target people who have already showed some level of verified interest in you and what you offer. Here’s a few of our favorite retargeting strategies. Whether they came through an ad or organically, sometimes prospects come to your website but don’t convert, right? Have you ever wondered why you may have hundreds, if not thousands of pageviews a month but less than 5% even become leads? The internet is more crowded than ever with competitors all vying for your prospect’s attention. (Some of them are likely advertising too!) Odds are, unless your web design and brand are extremely remarkable, there’s a good chance they’ll get distracted in the slew of options. 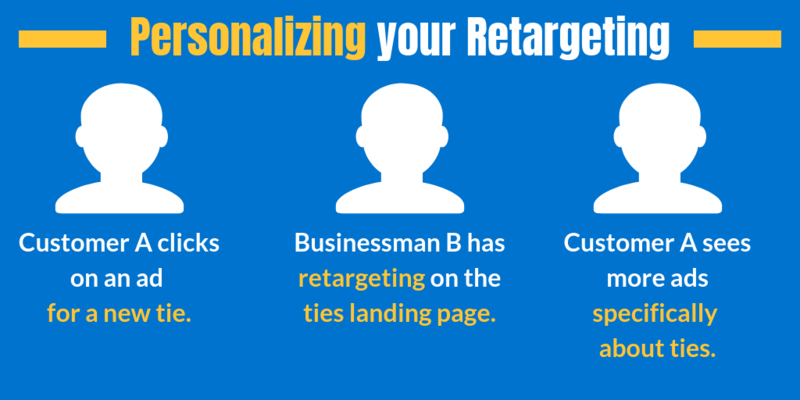 A great way to re-engage those people is through retargeting. You can use platforms like Facebook and Google’s Display network to show your clients attractive ads that build on your messaging. For example, our website is designed to appeal to business owners looking for digital marketing. If someone comes to our website, but isn’t convinced to work with us yet, we have to ask this question: “What else would encourage them to work with us?” As a result, we put together a Facebook, Instagram, and Google Display advertising campaign that features business owner testimonials. Here’s an example: These simple campaigns gave us the opportunity to build upon our brand to people who were already aware of us. We will get further in depth on how to retarget in just a moment, but as far as your sales funnel goes, retargeting website visitors is a great way to stay top of mind! Get creative with how you retarget! You aren’t limited to just throwing your home page visitors into a target pool and that’s it. If you are running ads targeting new customer acquisition, like we talked about above, you should be directing them to a landing page. If you have enough traffic going to your ads, try retargeting just the people who clicked on the ad and went through to the landing page! That way you can create ultra-personalized ads specific to the people who were interested in what the first ad was offering. Like in our example above, Businessman B may also sell suits, slacks, and shoes, but he knows this specific customer is looking for ties. With personalized retargeting, he can further segment the interests of the people he is showing ads to based on their behavior. Brainstorm ways you can use retargeting to engage people who have already demonstrated interest in your brand or offer! So how does online advertising fit into your sales funnel? It proves its worth by delivering the most precise targeting, getting you the most visibility as well as leads for the best price. Now, onto the next step: picking your advertising platform. 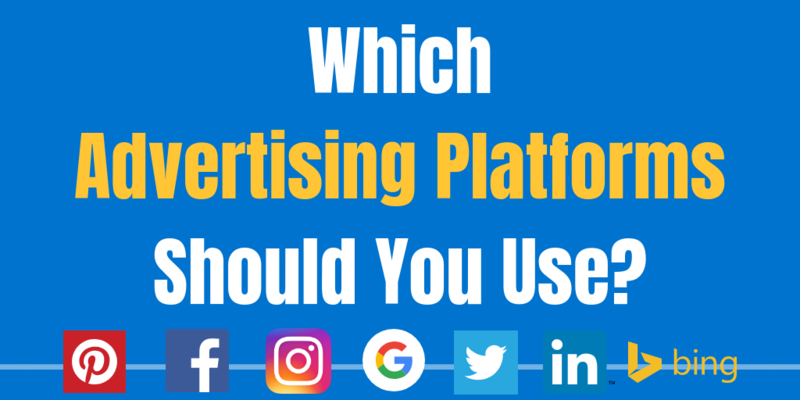 This is a question that we get a lot from prospective clients – which platforms should we be advertising on? With online ads, there’s not really a one-size fits all approach that we recommend. For example, we’ve run search ads for clients that reported around a dollar per click. We’ve also had prospects come to us, like personal injury attorneys, competing for keywords at $150 per click. Here, we are going to show you how to pick the best online advertising for your specific company so you can maximize your ROI. Google Search Ads are possibly the most well-known form of online advertising. Most people, even if they don’t really know how they work, have seen those first few search results with the little green words denoting that the search result is a paid listing. How should I make the most of my Google Search Ads budget? Google Search Ads are great for a few kinds of companies, but what companies should do specifically varies on budget. Larger companies can aim to dominate the search areas, especially prominent local companies. Smaller companies can use special tactics to carve out their own slice of the search pie. (If you’re thinking about outsourcing your online advertising, you should look for a Google Partner! Here’s why.) Here’s a few tips on making the most of your Google Search Ad campaigns. A great way to narrow down your targeting is to make sure you include geographical keywords in your targeting. What is geographical targeting? Think of when you want to find a local service, attraction, or store. What do you search? Do you type your city or town name? Do you type “near me”? Using these keywords can be a great way to narrow down your targeting if you want local clients. The simpler the keyword, the higher cost per click you’re likely going to encounter. 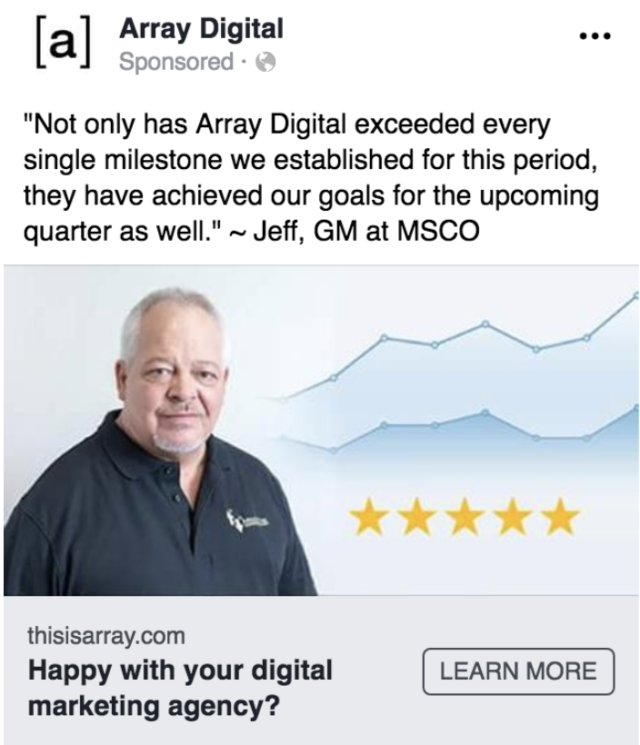 To use Array Digital as an example, it costs more to advertise for the keyword “digital marketing” than it does for a question like “how much does digital marketing cost”. Do you see how the second keyword is less generic but actually shows a better potential buyer intent? For longer, more specific keywords, there is often less competition meaning more clicks for your budget and consistently better targeting. Try and identify what kinds of questions or related keywords your ideal prospect might be searching and advertise there! A great way to present your brand to more people is to advertise over your competitors’ brand names. That way, you can borrow from their brand capital to identify more prospects for yourself. Not everyone feels the same way about this tactic, but nonetheless, it is a popular one because it works. You don’t want to trick people into clicking your ad by pretending you are the real listing, but you are simply presenting them with another option! If someone is doing this to you, you may want to spend a little bit more money here with ads targeting your own brand name. You can push them out of the top advertising spot and keep prospects coming to your website. Brands that take their name seriously make a regular practice of this. Take Apple (below) as an example. You might think that because they’re so popular as it is, they don’t need to run any ads to catch people who are searching for them. But they do! That’s valuable real estate. Don’t let other companies cut in front of you when it comes to your prospects! Our team uses Google Ads in combination with Bing Ads to get your company consistently into the top rankings of major search engines. Bing, which is owned by Microsoft, has three search engines — Bing, Yahoo, and AOL — so when you advertise on one platform, your ad is actually seen on all three. Many do not take advantage of Bing Ads, but those who are have opened themselves up to lower costs per click (the average cost-per-click on Bing Ads can be up to 70% lower compared to Google Ads) and an additional 63 million searchers that aren’t reached with Google Ads alone. Another major factor that has led to advertising for our clients on Bing Ads is the older and more educated audience. 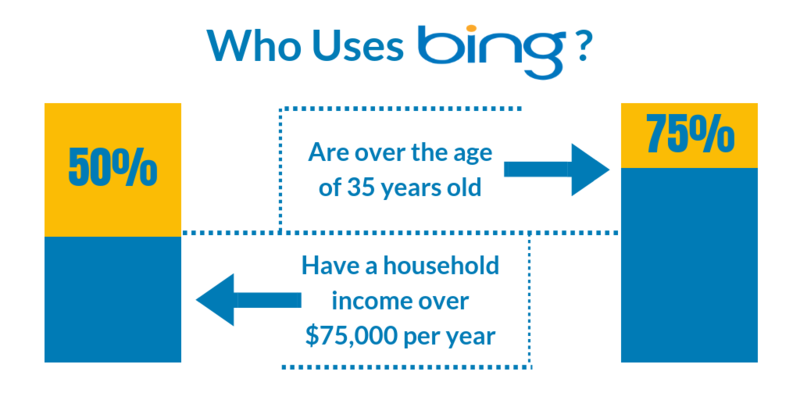 Almost half of Bing searchers have a household income above $75k and nearly 3/4s of Bing searchers are over the age of 35. All of these factors make Bing a quiet but valuable asset to your online advertising strategy. When you’re clicking around the internet, you’ve probably seen the wide variety of ads that pop up across the top, down the side, and throughout the web pages you visit. You may have noticed that frequently, these ads are coming from either companies whom you’ve recently interacted with or from similar competitors. For example, you may have recently done some research for a home improvement project on a site like Home Depot. You’re likely now seeing ads for not just Home Depot, but Lowes as well! This is the power of Google’s Display Ad network. Now we should note here that there are definitely some mixed feelings on display ads. People have called them annoying, disruptive, and other things. You may personally have never clicked on one, and we admit, that’s a pretty common response. But people who discount display because they “don’t like it” are missing out on a goldmine. Let’s start by addressing the concern: do people actually click on display ads? It is true, a successful display ad likely has a click-through rate (CTR) far below that of a successful search ad. But that doesn’t tell you the most important stat: cost per click (CPC). Here’s an example from a recent display ads campaign we recently ran: Now, if we told you that you may only get a 1-2% click-through rate but you could get 2,643 clicks for just over $350, would you do it? Of course you would! First of all, your brand awareness is maximized this way (check out those impressions), and even though the percentage is lower, you get the best CPC of any platform! At the end of the day, your goal is the most traffic for the lowest cost, and Google’s Display Ads deliver! Social media is a favorite for online advertisers because of its incredible ability to segment your advertising, allowing you to target the best audiences possible. Where else have people so willingly given so much personal information? Regardless of your thoughts on that, it works wonders for your advertising efforts. Targeting goes far beyond simple criteria like gender and geography. You can target based on personal networks to the second and third degree. You can target based on interests. You can target in just about every way you could want! There are several different ways you can approach social media advertising, but for right now, we will focus on using social ads to drive traffic to other places like your website. Generic targeting is a pretty user-friendly option for people just starting out but who aren’t putting all their budget’s eggs in this basket. This approach will give you access to a long list of useful criteria to segment your target audience, but if you are able to do more advanced targeting, you should absolutely step it up a level or two. Of the more basic criteria, we have a personal favorite. Our favorite is called the “Lookalike‘ target audience. Using this feature, Facebook will identify people with similar attributes to another target audience, for example, your current social media following. If your current following is made up of people who have either been your customer in the past or are likely to be a returning customer, a lookalike audience can be a great strategy. Facebook will find people with similar demographics as well as interests, associations, and friend groups, and include them as an easy way to potentially improve your targeting efficiency. 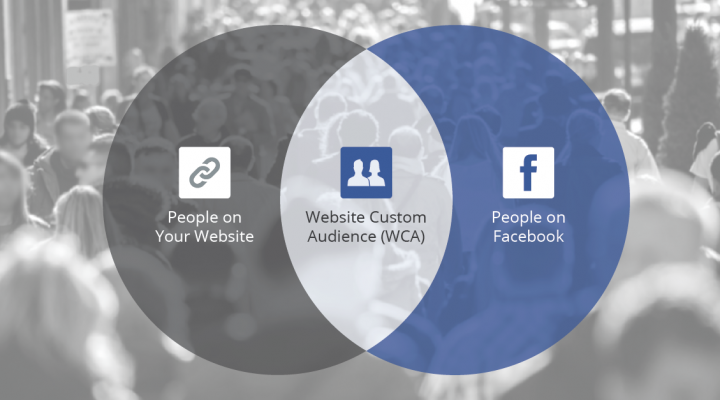 Facebook gives you the unique ability to target fully customized audiences. There’s a wide variety of ways you can create a custom audience, but we will go over two main ones. The first one is uploading your custom audience. This involves uploading a CSV file with a list of emails on it, which Facebook will look for accounts associated with those emails and advertise to them. When would this be especially useful? If you have a business model that emphasizes customer retention and re-engagement, upload your contacts! Any time you have a contact list that you want to reach with top-of-mind visual ads, upload your custom audience to Facebook and get started! We hope this helps you get off to a great start! Once you’ve picked your platform, there are a few ideas you’ll still want to pick up. To help you take your next step, here are a few of our favorite resources! How to Track Your Return on Investment (ROI) || by Search Engine Journal Is my marketing working? Which campaigns are performing the best? How to Optimize Your Marketing for Conversions || by Moz How do I know what to improve in my advertising funnel? Agency vs. In-house Digital Marketing: A Comparison || by Array Digital Which option is the best fit for your company? Which provides more value?